It is my pleasure to be here today with the Honourable Mr Hockey MP, and Commissioner Jordan as we head into an important two days of meetings with the G20 Finance Ministers and Central Bank Governors. International tax evasion and avoidance has been a headline issue for more than 5 years. In a context of economic and social hardship, these behaviours understandably raised questions about the fairness and integrity of our tax systems. 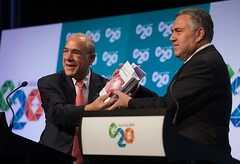 As a result, since the crisis, the OECD has been partnering with the G20, bringing together technical expertise and political leadership, to address those issues. At the G20 meeting today and tomorrow, I will be tabling some of the most important results to date from that collaboration. The BEPS Project is about tackling aggressive practices which erode the tax base and artificially shift corporate profits to low or no-tax jurisdictions - places where there is no link between the profit generated, and the underlying value creating activities – certainly the most prominent step towards modernization of the international tax system in a hundred years. These first seven outputs of the OECD/G20 BEPS Project include 4 measures that will target these aggressive practices, and 3 reports, which provide a framework for the next stage of the Project. What does this really mean in practice? It means for instance: closing the loopholes that allow investors to channel investments through countries to artificially access benefits granted by tax treaties; neutralising the cash boxes of those multinational businesses, which hold more than US 2 trillion dollars offshore in low-tax jurisdictions; and agreeing on an approach for addressing the impact of the digital economy on tax issues. We have agreed a minimum standard to ensure that tax treaties are not used to allow double non-taxation. A “country by country” reporting template will see Multinational enterprises produce consistent information to allow tax administrations to properly assess transfer pricing risks; revised rules on transfer pricing will promote outcomes that align with value creation in the key area of intangibles; and measures to prevent taxpayers from taking advantage of differences in the way different countries treat the same transaction or entity through so called “hybrid mismatches”. Critically, it is a package of measures which has consensus across the 44 OECD and G20 countries. We have already begun work on how these measures, combined with the deliverables due next year, can be put into place quickly using a streamlined implementation approach, such as a multilateral instrument. This year we’ve also made an important step forward on tax transparency – and this weekend I will be tabling for Ministers the full standard for the Automatic Exchange of Information, with all the tools needed for global implementation under a single common approach. This work lies at the vanguard of addressing tax evasion, allowing tax administrations to detect otherwise unknown income and assets transferred and held offshore, reducing the need for case-by-case and intrusive information gathering, while simultaneously deterring future evasion. We are looking forward to rapid implementation, with more than 40 countries (“early adopters”) already committed to an ambitious timetable that will see the first automatic exchanges take place from 2017. And this global effort to crackdown on evasion is already having a visible, practical, material impact even before it comes into effect: Thirty-seven billion euros have been identified from voluntary disclosure programmes targeting offshore evasion involving just 24 countries over 5 years. More will come! But to be most and fully effective, our work on international tax issues must truly “go global”. Given their heavy reliance on corporate tax revenues, developing countries are hit particularly hard by tax avoidance. They are also affected by tax evasion from wealthy individuals. We’re working hard, therefore, to ensure all countries, including low income countries, can participate and reap the benefits of the BEPS project as well as those from enhanced tax transparency, be it through exchange of information on request or automatic exchange. We are also supporting their implementation of the new standards with a programme called “Tax Inspectors without Borders”. 2014 marks an important year for the future of the international tax system: We collectively laid the ground for a step change in how it works. But implementation will be key now. At the OECD, we look forward to continuing to work with and for the G20 not only to find the best solutions but also to make them happen on the ground!